We made a field trip to the Science Museum today. We started the day with a visit to the Imax to see Forces of Nature, a movie about volcanoes, earthquakes and tornadoes. Had I known the content of the movie, we would have opted out, but Aleck took it all in stride. As the kids played in the grocery store section of the museum, I reminisced about our frequent trips when the kids were little. 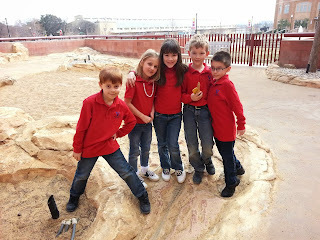 It just seems like yesterday and yet Aleck is almost too old to enter that part of the museum. I wish I could slow down time. 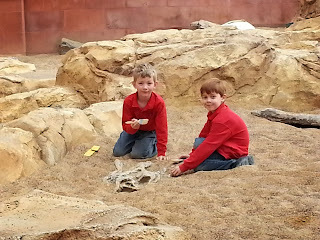 The dinosaur dig was a big hit with the kiddos. I think they would have stayed out there all day. The boys were so excited about their discovery!